Could the new offering be Amazon's ploy to run every consumer transaction, online and off, through an Amazon account? Amazon CEO, Jeff Bezos, has always sold investors and analysts on the future--the company's immediate strategy is about attracting customers, not just amassing profits. Even as Amazon bled money to the tune of US$126 million last quarter, the silver lining was that net sales were up nearly 25 per cent. Sales are the foundation of the company's future success--in short, Amazon needs consumers to keep shopping. Just a couple days before its quarterly earnings report, it launched Amazon Wallet, a beta app in the Google Play Store and Amazon's own Appstore for Android that acts something like Passbook on the iPhone. In its current form, it's meant to keep all of a mobile user's gift cards (for Amazon and elsewhere) in one convenient place, so they're always accessible when it's time to shop. The hook, however, is that users need to be signed in to their Amazon account for it to work. So now Amazon will know when users are shopping at retailers that aren't Amazon. Amazon already sells everything but the kitchen sink (and a few kitchen sinks), but it has no presence in the physical world. Short of opening a warehouse store, Amazon is constantly looking for a way in. 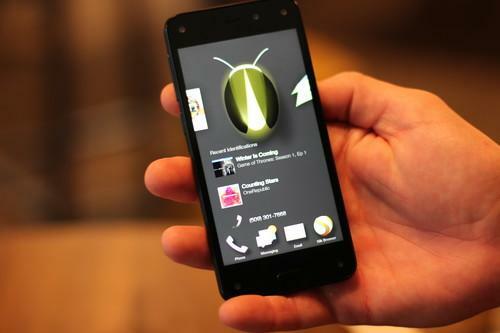 The Fire Phone (pictured) is the first serious step toward breaking down those walls--with Firefly, Amazon is turning the world into your shopping mall--and coupled with same-day delivery in some areas, Amazon is ever inching closer to mimicking the instant gratification consumers get from a store, even if it never gets its drone experiment off the ground. Wallet takes a bit of a different tack. By linking gift cards to an Amazon account, Amazon is peeking in on an individual's brick-and-mortar shopping. Amazon's complex ecosystem is built on getting consumers to use their Amazon account in myriad ways. From Prime to Kindle to Audible to Amazon Fresh to subsidiaries like Zappos and Wag, Amazon lets consumers purchase anything, wherever they are. Wallet is still in its infancy, but it seems inevitable that we'll eventually be able to link our credit and debit cards. In fact, when users log into Amazon Wallet accounts on the Web, they'll already see a list of all of the bank cards saved to their Amazon account, and Amazon is surely working on a secure way to expand the app to handle traditional payment methods too. But even if it establishes a strong foothold in the retail sector with whatever Wallet develops into, Amazon isn't necessarily gunning for Sports Authority's or Sephora's business with this move. The list of merchants who have signed on to support the gift card balance feature, includes not only traditional retailers like Guitar Center and Petco, but also places that Amazon doesn't directly compete with, like The Cheesecake Factory and Whole Foods. Amazon will be keeping tabs on how and when we use our gift cards to bolster its targeted advertising system, but that's not the primary motivation. Amazon's biggest enemy is cash, and Wallet is another step toward eliminating it. Almost as soon as it launched, rumours started ramping up about an upcoming card reader similar to what Square and PayPal offer. Amazon already processes transactions for other businesses with its Amazon Payments product, so a fleet of card readers shouldn't be that hard to implement. The eventual goal could be to turn Wallet into a seamless system for buying everything, online or off. All of the pieces are there. Even if its phone experiment fails, Amazon Wallet could represent a whole new chapter in the company's story, one that takes the experience off the Web and follows consumers everywhere they go.